Once the weather cools and the snow starts to fall, most of us gardeners enter a deep “green depression.” But our guide to growing healthy houseplants will help any gardener get through the winter doldrums. Besides winter therapy, houseplants have many other benefits. Houseplants clean the air; they can brighten a dark corner, and provide color, texture and interest to the home. To a gardener, home is not home without houseplants! Plants are simple; they only have a few basic needs. The following is an easy-to-read houseplant guide full of tips for taking optimal care of your indoor plants. Since most houseplants are tropical, temperatures are important. Most of our homes are warm enough (although cooling it off by a few degrees at night would actually help our little green friends). Most common houseplants dislike hot and dry conditions. They prefer a cooler, more moist condition than is typical in our homes. If you have a thermostat that allows you to adjust the settings, drop the temperature about 10 degrees at night and you will find some plants will reward you for it. For example, Phalaenopsis (or Moth) Orchids tend to bloom with short days and cooler nights! Plants need light, but different plants have different requirements. 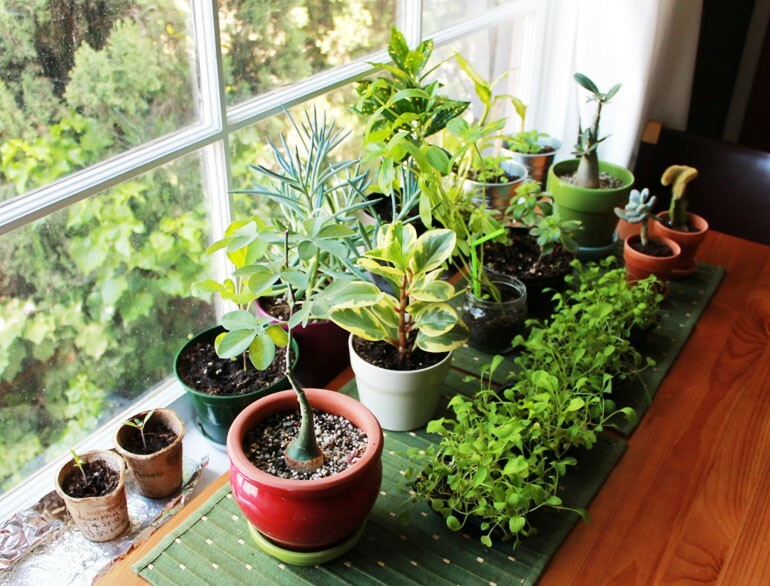 Try to match indoor plants to the environmental condition of your home. There are 3 key aspects of light to keep in mind: Intensity, Duration and Quality. Intensity is the strength of the light. Duration is the length of time the light is available. Compare an east window with a south window. Quality – there are many artificial light sources, but nothing beats the natural light of the sun! Another often overlooked secret is to clean the leaves. Dirty leaves block sunlight, glorious sunlight. Wipe the leaves with a damp sponge, or if your plant is easy to move, simply put it in the shower for awhile. Keep the temperature of the water tepid, not warm or cold. Another benefit of showering your plants is that insect populations might be reduced as they might go down the drain with the dust. If you do notice bugs left after you have given your plant a shower a great way to help kill them without harming your plants is to use Systemic Houseplant Insect Control. Plants need water. Plants tend to need less water during the winter than when they are actively growing; however, different plants have different water needs. During their active growing season, most tropical plants need moist, but not soggy soil.Consistently moist is a phrase I use many times each day. How do you get consistently moist soil without over watering? Good question! Each plant is different, they use different amounts of water based on how they are potted, how much sun they get, how warm they are…etc. The only way to truly know the answer to that question is to know what your different plants need and then observe the plant in its new environment and be ready to react to changing conditions. Some plants need to dry out slightly between watering, some need to stay moist at all times, and others need to dry completely between watering. One great thing to help with water spots on leaves after you water them is using a leafshine to spray on. Heating in our homes dries out the air to desert-like conditions.During the summer most homes (without air conditioning) have humidity levels in the 40-60% range. This is perfect for indoor plants. It is dry enough to inhibit fungus, but moist enough to keep them comfortable. During the winter however, with our heaters blazing, it is common for humidity to drop below 30%. Desert air has 10-30% humidity…much too dry for all but the cactus and succulents. 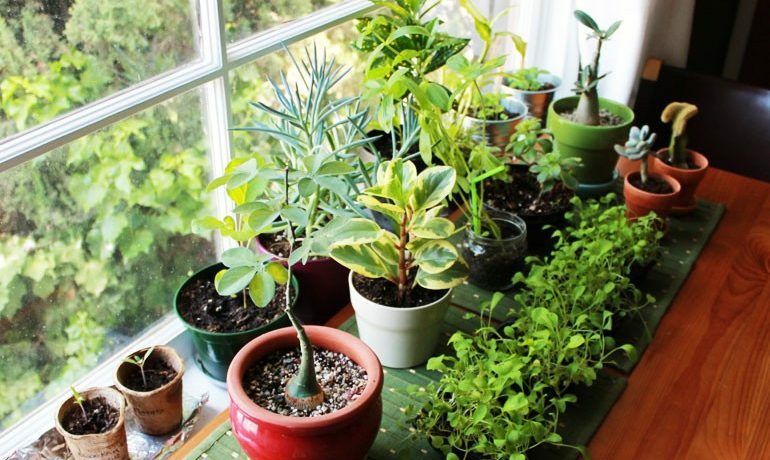 Rooms, such as the bathroom or kitchen, which tend to have a little higher humidity, are a little more plant friendly. If you want to keep your plants in drier areas, there are some things you can do; adding a humidifier to a room will definitely help, but there are easier ways. Just like people, plants need rest too. After a long season of growing new leaves, branches or perhaps flowers, plants need a break during the winter. You may notice plants that all summer had shiny new leaves will suddenly start to lose a few leaves as the days get shorter. Perhaps the leaves start to turn yellow in the middle of the plant, or maybe they simply look dull and not as happy as they did in the spring and summer. NEVER fertilize a plant that is too dry. If the plant is dry, water it well and then feed it a couple of days later. Plants that are stressed should not be fed and if there is ever a doubt just skip the feeding. Plants will do much better for much longer without food than with too much food. Winter isn’t really the time to be re-potting, but we can’t help it when we find the perfect pot! Remember that the plant is resting during the winter and you don’t want to encourage new growth when the light requirements can’t be met. Don’t hesitate to buy the new pot, just set the plant in the container until you can re-pot it in the spring; it is bad to have a pot that is too large. When you are shopping for a new container for your beloved plant, keep the size no more than 2” or so larger than the existing pot. If you love to redecorate with different colored pottery, you can always pot your plant in a cheap plastic pot that you can move from container to container without disrupting the roots. You will cut down on the mess of re-potting all the time and your plant will thank you for it!